You are here: Home / Marketing Massage / Groupon or not to Groupon – that is the question. Groupon or not to Groupon – that is the question. People don’t usually read the fine print. If you have specific details like for first time clients only or limits to the times they come in…people will do everything they are not supposed to. People may be coming in only because of the price and will expect that they will be able to come in more times at that price. These people will usually require more time to educate. People will try to challenge your rules for scheduling and will realize that the deal is almost up and they haven’t used their coupon. You might get hit with an overwhelming number of last minute appointment schedulers who will be upset if you are full. First thing though is to find out if it is legal for you to run a group buying offer. In many states it is illegal for massage therapists who are licensed as Health Care Providers to take referral fees. Many of these companies call what you pay them a referral fee. You have to read the contract to see what it says. They find the customer and refer them to you for buying. When there is a referral fee involved, it can be considered to be a kickback which may be illegal. There is often much discussion around whether or not group buying offers are really kickbacks or not as many kickback laws were created to stop other healthcare professionals from making money off of other practitioners. You will have to know your state laws or know how to find out. Basically, if you are a health care provider, you can’t give referral fees. Some companies might not be calling it a referral fee so you will need to check to see. I have also seen arguments that these kickback laws only apply when a health care provider is giving referral fees to other healthcare providers but you will really need to consult an attorney to find out for sure. Groupon collects 50% of the price of the groupon as its fee; is that illegal fee-splitting under applicable state law? Is the 50% fee an illegal kickback in exchange for a referral? Are you subject to federal laws in this area in addition to any state laws? How to run a successful Group buying offer if you so dare. Find out when you will be paid for the services. One company I heard wasn’t paying the therapists for 3 months or so after the offer. You should be paid very quickly. Figure out your cost per client and see how many massages you will have to do to break even or make a profit. Figure out how many clients you will need to convert into regular clients to make the numbers work. Look at other offers on the sites if you can to see what others are doing. Decide on your offer based on your own financial needs, budget and how many therapists you have and the time you have available. Make sure you create a schedule that you can still accommodate your regular clients. Be prepared to handle all the client inquires. Create a page on your website with all of the frequently asked questions like this savvy massage therapist did. It can help save time and having to make phone calls to just answer simple questions. You can negotiate different percentages with many of these companies. Use it to promote less time intensive services but that are also higher priced like a couples massage class. (See more on how to set up and teach a couples massage class.) Another service might be an aromatherapy session. The concern in offering massage at such discounted rates also requires that you do some careful thinking about what you are offering. Some of the negative comments I have about the whole process was about poor service from massage therapists. If you are a sole proprietor and doing all of the massage yourself, you will have a lot to handle. If you are giving the work to independent contractors, be sure they understand the goal and don’t feel resentful of working for such low wages. It will show in their work. The other part of this is often if you are an employee or IC, the business owner will try to pass the lower fee onto you and will pay you less and make you absorb the fee which is ridiculous. It is the business owners expense. The main goal in promoting yourself in one of these group buying places is to get a lot of people in the door to experience massage. Many will be in mainly because of the low clients and won’t really meet your vision of an ideal client which is someone who values massage. You will have to keep focused on the end result and showing clients the results that massage can provide to them. Have a marketing packet made up that has a few articles or research studies on something like back pain or depression to hand out to clients. Have the articles also on your website. It will take much more to try to convert people into a repeat client let alone a regular weekly or monthly client. Do a very thorough intake with them to get to know them and get to know how you can help them best. Do your best massage as always and teach them during the session how massage works and get them into their bodies to feel the effects and results. One of the main issues that is very controversial is that many think that this type of promotion is making people de-value massage and think that it should always be low cost. They will think that this is hurting the massage profession. The thing is we really don’t know. I wish someone would actually so a real research study on this. Value is not the same as market price. Value is in the eye of the beholder. Just because people want to pay less, doesn’t always mean that they don’t value the service. Yes, I am sure you will find more people who just want a cheap massage. The thing is that they most likely don’t know the difference between a really, really great massage – one that is totally geared toward their needs. They do not understand how massage works or why it works. They need to be educated as to the training and experience that you have and how your massage is different than everyone else. We have to teach every client the value of massage through our attitudes, presence and caring. Everyone has their own perceived value of everything including massage. How much is it worth to them to feel relaxed and nurtured? How much is it worth to them to be more productive in their life/work? How much is it worth to them to be calmer and more centered/focused? How much is it worth to run faster, hike farther, ride a bike faster/farther? How much is it worth to be pain free after years of being in pain? Not everyone will be a keeper client! Yes many if not most will be there only because of the price and no matter what you do, the won’t get it. People who are not able to see the value in massage are just misinformed. Think of it as an education opportunity. It is also really showing you what needs to be done on a larger level as far as showing people the value of a massage. People just may not know how much time and energy you put into your career. People don’t know. Don’t waste your time or worry over it. Don’t let it get to you. It isn’t personal! But it only really takes one person to become a regular client and by regular I mean a weekly client who will come for the next 20 years! How much is that worth to you? If a business continually runs a group buying deal, then that is another issue. It will eventually devalue massage for that business and people will come to expect only cheap massage. Running one once a year is different than running them once a month. If you are having to do that – something is wrong. If you feel like you are resentful when doing a massage on a group buying client or feel undervalued in your job or your life, it will come through in your work. Offering your work at a discount can often leave you feeling undervalued. You have to be strong enough in your own self confidence to successfully offer group discounts. This is a good reason for getting regular supervision. Get your website into shape so that you can easily be found by the search engines and get most of your clients that way. Offer your own discount on your Facebook page or other social media site. See the social media section. While I have not seen any evidence of anyone enforcing this law or getting in trouble for running group buying deals, I would surmise that it is only a matter of time before someone starts complaining about them and everyone will be in trouble. I have a friend that, on Groupon, sold 874 massages on her one day run. This is a great way to get people in the door, obviously. * A lot of people coming through the door. * A sizeable up front payment. * Not everyone will use their groupon coupon. * You get your hands on A LOT of people, which makes you a better massage therapist. * The ad was $40 for an $80 massage. Groupon takes half. So it’s $20/massage. * The down side of selling 874 massages is that you just sold 874 massages. At 5 per day 7 days per week that’s 6ish months of $20 massages 5/day 7 days/week. * Huge scheduling rush at the beginning, requiring serious schedule time and strategizing for non groupon business. Not necessarily a bad problem to have. * Most people are just there for a cheap massage. Still, you will retain some number of new customers. * If you have employees or peers doing the massages, there’s no profit ifyou’re giving them the $20/massage, and possibly even a negative per massage due to sheets, utilities, etc. I found Groupon to be an excellent way to build a practice from scratch. There are lots of people looking for a massage therapist that simply don’t want to pay $65-70 for a service that doesn’t meet their needs or a provider they don’t click with. Having discount packages in place and giving my best service helped me convert those clients easily. I run A Massage Service Call Body Massage Spa In Queens And Manhattan NY, Offering Mobile Massage Services,Im On The First Page On Google For Mobile Massage,Traveling Spa,Traveling Massage,Mobile Spa,In home Massage And A Few Other Keywords For $120 Dollars, Im Trying To Expand And Could The New Clients, How Much Will They Lower My Rate Of A $120 A Session And Would It Help Me Expand? Unfortunately Groupon will not run a campaign for Mobil massage or Traveling Spa services. You must have a “brick and mortar” location or store front you work out of. In Full Disclusure I am an Account Manager for Groupon. Hi. I am planning on offering a groupon in March and I am wondering how to set it up so they can book their groupon massage through my online scheduling. I am hoping to reduce the influx of calls this way. Do any of you have experience with this and would be willing to share any suggestions? Thanks! just add a service called massage with voucher or something like that and have it say somewhere in the offer that you can only schedule online or something like that. It’s important that you have them register their voucher on your list before they can redeem then call to verify appointment. This way you can run your own offers and promotions directly to past deal customers without having to give Groupon half the profit. I would suggest you maintain specific hours (between 12pm-4pm) or certain days (Mon, Wed, & Fri. only) that you will work on Groupon Clients. If your campaign sells well, you can risk losing loyal non-groupon clients do to lack of availability. Also, specify your business cancellation policy (fees, etc. ), perhaps include a 48 hour delay from time of purchase. You will have many groupon shoppers who will buy them only to get in TODAY! 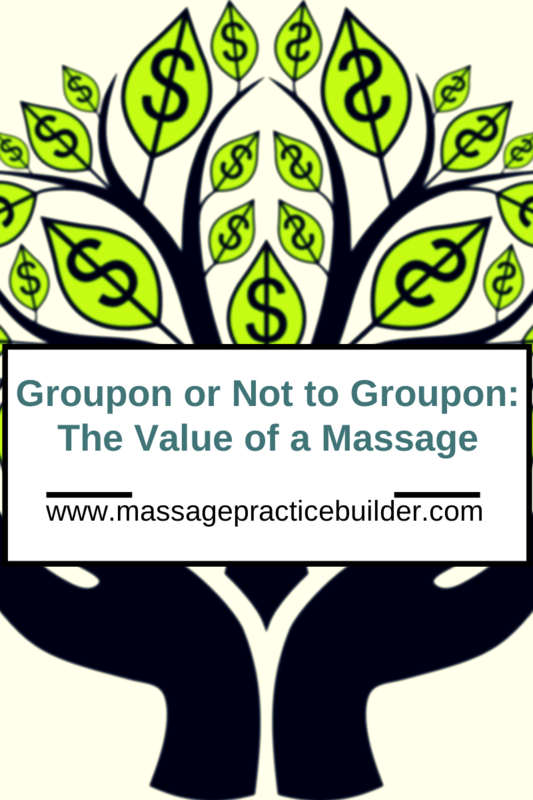 Also, beware of groupon customers who redeem and get a refund from Groupon immediately following their full massage service. (It happens.) I hope your campaign runs smoothly. Used Groupon in 2013 now wondering why the IRS wants me to pay taxes on the amount Groupon received. Not fair, any input on this situation? You’d have to talk to an accountant/tax attorney…but yes in general I would say that the full amount of the offer would have to be reported and you expense out the fee you pay Groupon. I hadn’t thought of that part! That is what I do exactly. I add up the total amount I was actually paid from Groupon and subtract that from the full amount received for the sale. The difference I claim as an expense. At my office, we found lots of misgivings when using Groupon/Living Social/Amazon Local. Many of their clients wouldn’t supply us with emails, phone numbers, or even correct voucher numbers, making re-marketing impossible. We found our brand somewhat tainted because when you searched the Spa name, Groupon always dominated on Google, Bing, and Yahoo. Our clients would see their daily deal offer with our business name associated before clicking on our website for more information. For us the solution was simple. We started using another marketing provider called Massage Advantage, they run the promotions, help with the re-marketing, it doesn’t taint our brand, and their appointment requesting site at http://www.GetMyMassage.com now allows us to receive and email with completed client information before we schedule the client. This not only saves us money but a lot of time while leaving our business open 24/7, 365 to accept massage request. So if you know how to manage it correctly, you can make daily deal sites work, but it’s all a matter of if you have the time to do it yourself or have someone like the company above do it for you.